After starting tb, the first time I want to move a message with <Alt>Message>Move nothing happens. The drop-down menu just sits there with the "Move" entry highlighted, but no sub-menu appears. I tried to do a screen shot, but that didn't work. Thank you for submitting this bug and reporting a problem with <Alt>Message>Move in Thunderbird. You made this bug report in 2015 and there have been several versions of Ubuntu and Thunderbird since then. Hi Humphrey. Thanks for the update and the apport info. I'll look at next steps. Tested in Ubuntu 16.04, Thunderbird 52.9.1 (64-bit) and could not replicate the problem. Tested in Ubuntu 18.04, Thunderbird 52.9.1 (64-bit) and could not replicate the problem. 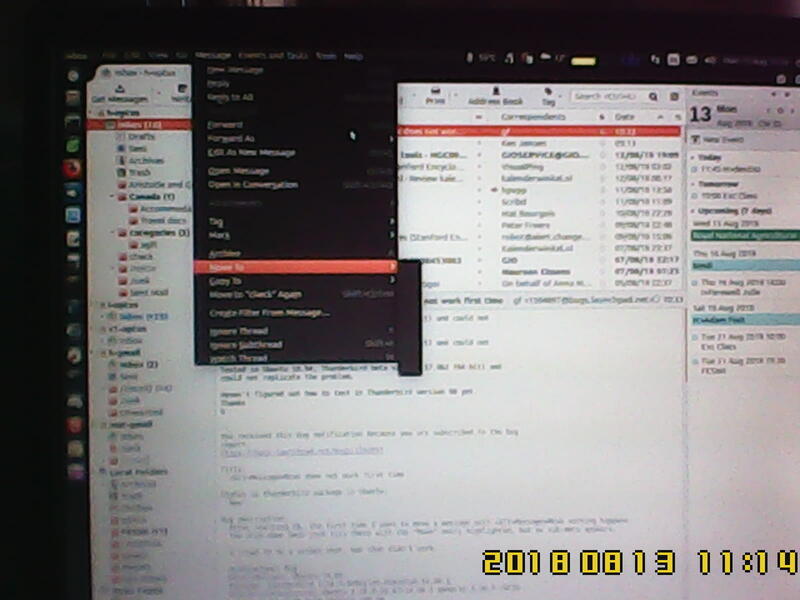 Tested in Ubuntu 18.04, Thunderbird beta version 57.0b2 (64-bit) and could not replicate the problem. Haven't figured out how to test in Thunderbird version 60 yet. see attached photo (taken with my phone, because I can't figure out how to take a screen shot here). Thanks for picture. Sorry for the extra effort you had to go through to get the picture to me. The picture is most helpful to visualize what is happening. I think by your apport files that you are in Ubuntu version 16.04? Are you thinking of upgrading to 18.04 sometime soon? By the way, I use a small screen capture program called "Screenshot." It allows you to set a delay, and it will wait a specified time before taking the snap shot, so that you can go through the steps for a bug, like this Alt-m-m issue. upgrade to 18.04 when that is worthwhile for me to do. Am I wrong here? > Thanks for picture. Sorry for the extra effort you had to go through to get the picture to me. The picture is most helpful to visualize what is happening. > you thinking of upgrading to 18.04 sometime soon? > like this Alt-m-m issue. Shall we wait until you get 18.04 and see if it is still a problem for you? I will poke away at you again in a few weeks time, to see if you have upgraded and we can try it out again. I am preoccupied at the moment so upgrading to 18.04 will have to wait, possible a few months even. OK, Humphrey. If you don't mind, I will set a bring forward date of a month from today and contact you again on this. Take care and hope you get a chance to upgrade soon. I will hold off upgrading to 18.04 until bugs 1790249 & 1790251 have been fixed. OK Humphrey, I understand about not wanting to upgrade. Set yourself as a subscriber for those two tickets, will you? That way when there is any action on them, you will get an email.